Family kitchen and breakfast bar for 10! This is an exquisite home which will leave you, your family or guests with warm memories in a home styled, furnished and decorated with no expense spared! This home was purchased in August 2012 and has been completely refurbished with all wood floors throughout the home, new paint, granite counter tops in all the baths and kitchen, new furniture, new beds, new bedding, new towels etc� The attention to detail is obvious wherever you look. Whoever stays in this home will be yearning to return as soon as possible! 8 flat screen LED TVs, 8 DVD players, PS3 & Xbox 360 Kinect, Cable (85 Channels), Hi speed WiFi is available throughout the home and pool area so you can use your I-Pad, I-Phone, smart phones and computers. Patio doors leading to pool have child safety locks, door open chimes/alarms and a pool safety fence. 2 hotel type safes are provided for your convenience. On entering the home there is a formal salon, furnished with a cream leather corner unit sofa and matching tables and lamps. This is a perfect haven away from the central hub of the home for some quiet reading time or vacation planning. Adjacent to the salon is the formal dining area consisting of an elegant and contemporary dining table and chairs with a lovely over the table lighting fixture to compliment the general ambiance of this elegant setting. This is a great place for holiday dinners and those special occasions where the ambiance will make it memorable! There is a dividing wall from this room to the family kitchen. The dividing wall has not escaped the attention to detail. The wall has some ornament nooks that have been further enhanced with spotlights, granite shelf tops and accented with mosaic tiles. Moving on to the large family kitchen you will find a huge granite top center island with seating for 10. This is a great place for family counsel when planning vacation days as well as a place to have having family breakfasts and meals. It is fully equipped with all you need to prepare snacks or meals. All pots, pans, flatware, silverware and glassware are supplied along with plastic plates and glasses for use in the outside areas. Electric appliances in the kitchen include, stove/oven, fridge/freezer, ice maker, waste disposal, toaster, coffee maker, dishwasher, blender etc. There is patio door access from the kitchen on to the outside pool deck area. This great room is the central hub of the home with high ceilings, a view over the pool and conservation area and access to the private pool deck area through patio doors. The room is also open to the kitchen from behind and the loft overlooking from above. I suspect this area will be everyone�s favorite place to hangout for quality time with family or friends. 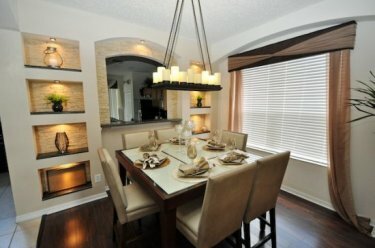 It is furnished with a large black leather corner sofa unit and matching tables and lamps. The room has a 55 inch wall mounted flat screen LED TV with a surround sound system and a Blue Ray/ DVD. This room is surely the one to set this home apart from the competition! The villa has its very own private theater/ game room! This room is not to be confused with other similar homes attempts at converting the garage space into a game room by simply placing a few game tables in the garage! This room has had a professional conversion carried out with great attention to detail. The room has wood flooring and wood paneled walls and ceiling, dimmable wall lighting for setting the right atmosphere. The room has its own separate air conditioning unit for your comfort. It is furnished with cinema style seating with cup holders which face the huge 100 inch screen! For a real cinema experience DVD's can be enjoyed on this screen with an overhead HD projector and theaters surround sound system. To top it all off there is even a small popcorn maker to add to the authentic cinema experience! This room is a truly awesome feature of the home! For further entertainment there is a Foosball table at the rear of the seating arrangement. The LAUNDRY ROOM is equipped with a full size washer and dryer, iron and ironing board. 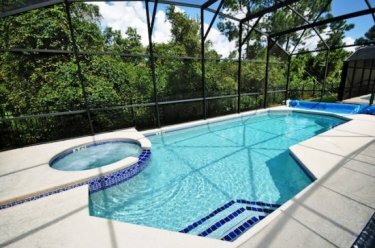 The POOL DECK AND LANAI AREA is an outside space where your family will no doubt spend much of their time enjoying the Florida climate is wonderful. There is a large 14�x30� private pool with a view overlooking the conservation area! The swimming pool also has a bubbling spa attached, the perfect place to unwind after a hard day at the Theme parks! The private swimming pool has a child safety fence to help protect the non-swimmers of your party. The oversize pool deck area is fully covered with a screen enclosure. This enclosure helps keep the bugs out but still lets the sun shine through. The pool deck has a large lanai (covered) area for some respite from the sun and is a great area for the family to hang out. The area is furnished with chairs, sun loungers and tables. There is also a gas BBQ grill for your enjoyment (grill cleaning and propane refills are guest responsibility). For our more competitive and energetic guests there is a ping pong table and basketball shoot out game in the lanai area! The pool screening has had some privacy screening added which affords some privacy from neighboring homes. The villa backs right on to conservation land so there are no rear neighbors in this villa. The MASTER SUITE 1 is also on the ground level. This luxurious master suite is furnished with a high quality dark wood ensemble consisting of a King size bed, dresser, upholstered chair, radio alarm clock iPhone/iPad/iPod Docking charge station, nightstand and lamps. The room also has a wall mounted 32 inch LED TV and DVD player. There is a large walk in closet in this bedroom. A programmable safe designed to accept a laptop computer is also fitted as well. The private en suite bathroom has a large tub bath, separate walk in shower, W.C., sink and granite top. Moving upstairs you will find the remaining 6 bedrooms. Exquisitely furnished with a King size bed, 40 inch wall mounted TV and DVD player, ceiling fan, dresser, 2 night stands radio alarm clock iPhone/iPad/iPod Docking charge station and lamps. The room also has a walk in closet. This master en suite bathroom has granite sink top, bath with shower and W.C. There is also a programmable safe in this room for your valuables. Has a King size bed, wall mounted 32 inch TV and DVD player, dresser, nightstand and lamps, radio alarm clock iPhone/iPad/iPod Docking charge station, built in closet. BEDROOMS 6 & 7 are equipped each with a bunk bed and a twin (single) bed, built in closet, 32 inch wall mounted TV and DVD player, chest of drawers, lamps. One of the rooms has a PS3 game console and selection of games for the kids (and adults!) amusement. 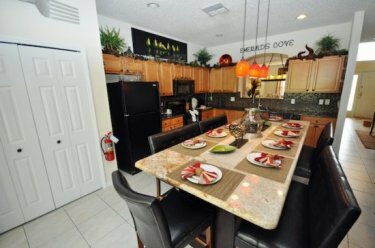 Also on this level are 2 more full family bathrooms each with granite sink tops, bath with shower and W.C.
With the nearest Disney World park only 2 miles away you will feel like you are already at Disney World! Within a 30 minutes drive there are a multitude of other theme parks and attractions; Sea World and Universal Studios are some of the favorites. 12 Golf Courses and many golf academies for every ability are close by with Mystic Dunes only 2.3 Miles away! If golf is your game, Kissimmee is a vacation dream come true. Our year-round warm weather and variety of golf courses are for everyone from beginners to touring pros. There are World renowned golf courses designed by golf greats are all within the area; Grand Cypress Golf Club (Jack Nicklaus); Orange County National Golf; Orange Lake Country Club (Arnold Palmer/Ed Seay); Walt Disney World Golf Courses (Pete Dye, Tom Fazio , Joseph L. Lee); Celebration Golf Club (Robert Trent Jones); Champion's Gate Golf Resort (Greg Norman). Lake Louisa State Park is only 15 miles away from the home. Lake Louisa is the largest in a chain of 13 lakes. It offers fishing, kayaking, canoeing. Anglers can fish in four of the park�s six lakes, but gasoline powered engines are not allowed. For hikers, there are more than 25 miles of trails. There are horse and equestrian trails. In Kissimmee the possibilities are endless. Just a quick drive south of Orlando puts you right in the middle of all the activities and attractions that turn family vacations into non-stop fun and lasting memories. Go flying across the water on a thrilling airboat ride and discover a world alive with tropical birds, turtles and legendary alligators. Travel to Old Town or tour the brick-lined streets of Celebration, where colorful restaurants offer a variety of dining options and unique shopping possibilities. There are several Horse Riding Stables with hundreds of acres to explore on horseback. Beaches on the Atlantic Coast are 1 hour drive away. Don't miss Cocoa Beach or the Merritt Island Beaches. The worlds most famous beach 'Daytona Beach' is an additional 30 minutes drive. Gulf Coast beaches are about 1 hour & 15 minutes away. While you are out there don't forget to let the kids see 'Winter' the Dolphin from the movie 'Dolphin Tale' at the Clearwater Marine Aquarium. Don't forget Florida has many other attractions such as Lego Land, Busch Gardens, and the Kennedy Space Center at Cape Canaveral! 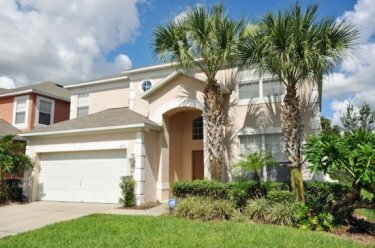 If you are ready for your vacation then contact us & see how to enjoy it in one of the most luxurious properties in the Kissimmee area. Cleaning fee is USD140.00 - No cleaning fee for stays 7 days or more! 20% of the rental amount is required (or the full rental amount if the reservation is being made within 60 days of arrival) before the reservation request can be processed to confirm a reservation. Payments can be made by credit card, check or bank transfer. Any bank fees such as returned check fees, transfer fees or foreign currency exchange fees will be paid by the guest. Final and full payment is due 60 days prior to arrival. In the event of late payment, or failure to pay, the owner reserves the rights to levy the cancellation penalty percentage charges against any money that the Guest has paid in advance and cancel the booking of the Guest. Where the money paid in advance is insufficient to cover the calculated percentage, the owner reserves the right to exercise any legal remedies to pursue the amount owed by the Guest. A rental agreement and instructions on accessing the property will be issued only after the payment in full is received. This holiday home is currently unavailable - please use the search facility below to find available holiday homes.